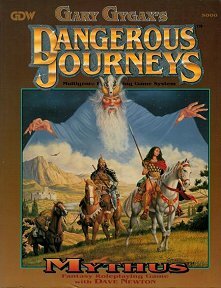 Core ruleset for the fantasy game within the Dangerous Journeys system (the only bit to get published). Publisher's blurb: "Roleplaying at its finest - simple or with elective complexities which place this game far beyond any other. "Straightforward mechanics, with emphasis on percentile dice and the six-sided die, yet allowing a battery of optional modifiers to heighten realism to any degree desired. "More than 50 starting vocational backgrounds for Heroic Persona creation, plus as many personalized ones as the gamemaster wishes to add. "A 'Knowledge/Skill' system using percentile probabilities, with hundreds of areas and sub-areas to learn, and specializations too. With Joss, Socio-Economic Class considerations. Special Connections, Quirks, background information, and more included, never have RPG personas had the character and personality of the Heroic Personas herein or has roleplaying been so detailed and enabled. "More armor and weapons included than would be found in the arsenal of a medieval potentate! Use them with a short and easy combat resolution method, or with expansions that take into account virtually every salient feature of armed, magickal, and mental or spiritual battle, too. "Persona advancement based on logical and realistic standards, not relying on loot garnered and critters slain. No totally fanciful monetary system with ridiculous standards and confusing pricing. Income and costs are as easy as knowing what a BUC is."